I don’t have anything interesting on my design wall for Judy’s Monday, since I’ve been working on Mom’s quilt almost exclusively. However, so many of you do giveaways, and it seems like a fun way to brighten someone’s day. I have a layer cake I’m not going to use, and some assorted other odds and ends; what better way to pass it along than a giveaway here? It’s not a huge, elaborate, OMG I WON giveaway, but hey – I’m broke. Package One: A complete Moda Hello Betty Retro layer cake. Bear in mind, this is the retro colorway – not the … um… non-retro one. This one has greys, reds, blacks, oranges and turquoises, not pinks, blues, greens and so forth. 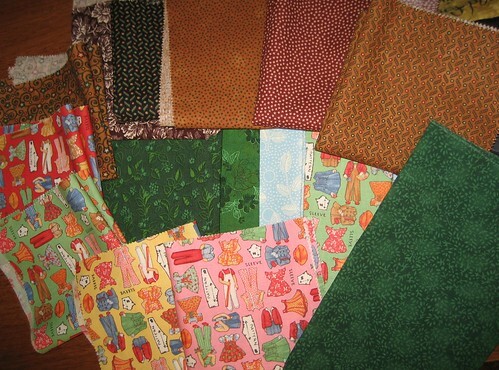 Package Two: Several fat quarters and layer cake sheets of American Jane Snippets, several Kansas Troubles Kansas Winter layer cake sheets, plus assorted other FQ’s. The Snippets bits would be great for doll quilts or kids’… stuff. Whatever stuff that might be. More fabric might get added to this package, but nothing in the photo will be removed. For Package Two, post a comment to be one of the names I draw out of a bowl – no special tutorials required. I don’t tend to get an enormous volume of traffic, so your odds here are pretty good. I’m not even going to ask you to link back as a cheap way of driving traffic to the site – I really just want to give this stuff away. The giveaway closes on Thanksgiving – Thursday, November 26, 2009 – at 9pm Eastern, and because I don’t want to fill out customs paperwork and whatnot, is only open to US recipients. Sorry about that, if you’re out of the country. Erin, Thanks for offering the give-a-way. I can’t tell you how to make the quilter’s knot but I would love package #2. I make quilts with our church group to give away and these would be just perfect for our next project! Thanks for the offer! Hi Erin! I think you’re talking about the knot for hand piecing? I used to do this! If I remember right you lay the threaded needled on your pointer finger of your left hand pointing up and down with the eye at the top. Hold it in place with your thumb like your pinching it. Then take the end of your thread and bring it up across your thumb and around the top of the needle twice – like your drawing 2 small circles. Now add your thread under your holding thumb to keep the circles tight. Then use your free thumb to pull the needle down from under your holding thumb. Keep pinching at the top so the circles stay tight! Eventually you will have the little knot pinched in your left thumb and the needle ready for quilting in your right. Not sure how clear this is but it should work:)Maybe someone else can be more concise!! Good luck! I never learned how to make the quilter’s knot, but would love to be entered in the give-a-way for package #2. I enjoy reading your blog. With your right hand, hold your threaded needle with the pointy end up in the air. Take the long end of the thread with your left hand and loop it twice or three times around the pointy end and then pinch the pointy end with your left hand. With your right hand place your pincer fingers up over the thread wound around the needle and slide the loops over the eye and down the length of thread, stopping where you wish. Snug up the knot by a gentle tug on the loose tail below the knot. I’ll try to explain the knot – I’m right handed. Hold the threaded needle in your left hand pointing the needle to the right. With your right hand, bring the long end of the thread up needle and lay it along the needle – tail end pointed to the eye. Hold the tail with your index finger on your left hand. With your right hand, wrap the thread over the needle 3 or 4 times. Point the needle straight up. Now with your right hand, pinch the thread wrapped around the needle, and pull the needle straight up with your left hand. In theory the thread should pull down into a nice tight knot. When my husband followed these instructions he got the knot, but managed to unthread the needle. I am very interested in that layer cake. Maybe I should learn to do that knot. Great giveaway. No giveaway is too small. I have been thinking about having one too. Maybe for my 100th post. I tie a knot by holding the end of the thread in one hand and the rest of the piece I have cut off to use in the other hand and then put the right thread over the left, then the left thread over the right. http://www.youtube.com/watch?v=ZVzDkAbziLw someone already did a video, and it looks simple, so here it is. 2. Thread needle again after pulling thread out while looking around for drink. 3. Trim thread several times, since the damn thing won’t go through the hole anymore, and you’ve licked it so much it’s starting to glisten. 4. Ask husband, boyfriend, or pizza delivery person to thread needle for you. 5. Holding needle between thumb and forefinger, hold one end of thread (left end if needle is in your left hand)between the fingers and palm of that hand. 6. Get tired and decide to watch TV instead. 7. Pick needle back up and try holding it again. Figure you just need to keep that thread out of the way and tape it to your arm instead. 8. Take other end of thread and make a loop that is longer than the needle, holding the end of the loop in between the same fingers that are holding the needle. 9. Drop everything and curse the needle and thread to hell for all eternity. 10. Once you have it all back in place, take up some of the thread from your loop and wrap it around your needle three times. 11. Holding the thread taut with your right hand, inch your left fingers (the ones holding the needle) up over the loops you have wound around the needle, until you can begin to pull the needle up through your fingers and through the loops you just made. 12. Keep pulling thread, while keeping your fingers together, until you feel the knot tighten into a little ball. 13. If instead you feel a rats nest that is roughly the size of your fist, complete steps 1-12 again after drinking several strong cocktails. I like step 13 above. I’m a lefty. I thread my needle, put the needle horizontal pointing to the right between thumb and index finger. Tuck one end of the thread next to the needle with the long part of the thread pointing the same direction as the needle. Wrap the thread around the needle two or three times. HOLD THE WRAPPED THREAD FAIRLY TIGHTLY as you pull the needle and all of the thread through your tightly held fingers. When you come to the end, you will have a knot. The secret is holding the thread the correct direction, and holding until the end of the thread goes through your fingers. Good luck, it took me quite a while to master it, but DH is amazed every time he watches it. It is just doing a French knot in the air. Have no clue on the quilters knot. Sorry I can’t help you with that. But the instructions you are getting have me curious to try it. French knot in the air… I can probably do that. The fat quarters are adorable. Wow, not even gonna attempt the knot. Years ago my mom taught me a different kind of knot and I’m gonna stick with it! Love package #2 though! Thanks for the entry, and Have a great Thanksgiving! Don’t need to win since I cannot quilt, can’t even machine sew, just hand sew. But I did some hand quilting as a girl and I remember the knot! I found the easiest way was to keep the needle closest to where you pull the thread up. This makes a tighter knot and it’s harder to screw it up. Next make the knot as close to where you yarned up as you can, this makes it less likely to have a gap. Then pull tightly! This atleast did work for me! Have you ever done embroidery? A “French Knot” is similar to a quilter’s knot. That works for me. After you have made the knot, use your finger nail to stretch the fabric and give the thread a firm tug, or scrape the knot with your finger nail. It should hide between the fabric and batting. Go with what works for you. Good luck mastering the knot. I love the second group of fabric. You got me on the quilters knot. Sorry. But add my posting to the 2nd giveaway. Well ,the quilter’s knot is one that is made with a needle held by your fingers, I guess? I dunno, either, shucks. So, even though my Momma’s name was Betty, I will sign up for number two, please. And good luck on your venture, I enjoy reading along! Wow, you guys are full of helpful hints! Picking a winner for the layer cake will be difficult. I’ll have the winners announced on Friday morning – thanks, all! Ok, ladies – winners announced soon!